What happens when a devout Christian minister and equally devout Orthodox Jew 9,000 miles apart wrestle with the most sensitive of subjects, while 100,000 people across the country eavesdrop? They discover is that their two faith traditions have a lot more in common than they think. "We don't shy away from our fundamental differences, but it's always with respect and the quest for understanding," says Harold Berman, the teacher in the radio show "The Teacher and the Preacher." The show airs weekly in Texas, Colorado, Idaho and Oregon, and is also available via live stream. Though they almost never see each other--living as they do in Israel and Idaho--co-hosts Berman and Pastor Dave McGarrah recently had a rare opportunity to interact face to face. The topics on the table were not easy ones: original sin and why Christians believe that the messiah, in the person of Jesus, has already come and why the Jews are still waiting. But unlike many such debates, the two actually listened to each other. "We really try to see things through the other one's eyes, and then work to put our beliefs into words the other one can hear," says Berman, a native New Yorker, writer and former executive director of the Jewish Federation of Western Massachusetts. "The surprising thing is how when you go through this process week after week, you don't get pulled into the other one's way of thinking but actually strengthen your own beliefs." Much of what they shared with the audience on Feb. 11 in Jerusalem, where McGarrah is leading a tour of Christians, several of whom are congregants in his Free Methodist Deerflat Church outside Boise, reflects the spirit of the show. Each week for nearly three years, they've explored everything from their faiths' approach to free will to President Trump's decision to move the U.S. embassy to Jerusalem. One topic comes up quite a bit: interpreting the Bible. When people of different faiths read the same words in what Jews know as the Torah and Christians call the Old Testament, they often interpret them very differently. For example, when discussion turned to the messiah, the pastor was able to cite chapter and verse from shared biblical sources, which he insisted meant that the redeemer had already arrived. Berman said Jewish readers interpret the same verses as indicating that the time has not yet come for this redemption. "Listening to them talk, we could hear how, even through our differences, so many of the basic concepts are the same," said Emily Byerly, the pastor's congregant and a regular listener of the show. As for her impression of Israel, she replied that "you read about, you hear about, you watch the news, but until you get here, you can't really appreciate the country or the people." Like many other Evangelical Christians, McGarrah and most of his congregants are staunchly pro-Israel and tend to defend the Jewish state. "I am always telling the guys I work with that Israel is doing the best she can in a tough spot," said mission-goer Micah Davenport. "I live not far from the Mexican border, so what would happen if they decided to attack us? Would the U.S. just sit there? A country has the right to defend itself." Jonathan Segal, a native of Buffalo, N.Y., now living in Efrat, said "it was heartening to hear a dialogue between Christian and Jew without any hidden agenda. The only agenda I could see is to really listen and try to understand the other religion's side while still expressing your own beliefs." McGarrah agrees, saying "ours is a new kind of religious dialogue based on authentic understanding and mutual respect. And we get to share it with 100,000 listeners every single week." "The distance we're bridging isn't just the miles; it's generations of misunderstanding and fear, skepticism and hostility that we're working to overcome," adds Berman. "In our dialogue, no one is trying to convert anyone else." McGarrah sees their ongoing dialogue as something of a family union. "The Jewish roots of Christianity have been cut off, and many of our listeners have never had a meaningful conversation with a Jew," the pastor said afterwards. "But today this is changing, and one thing we can do together is celebrate what it means for the Jewish people to come back to their homeland." His counterpart, Berman, explained that what's different now is that the Jewish people have a homeland to return to. 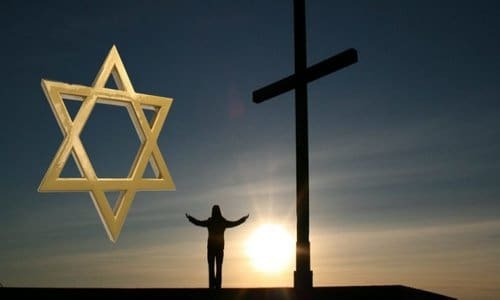 With Israel a sovereign nation, "it means Jews can engage Christians from a place of strength, so we get a level of dialogue that's never happened before." To bring that dialogue home, the co-hosts plan to lead a "Teacher and Preacher" Israel tour in October, inviting Jews and Christians to travel the country together, sharing perspectives on historic and modern-day Israel.